The Mass today, is the coming together of like minded Christians to do what the Lord asked us to do at the last supper. 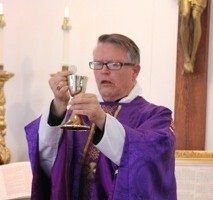 His commandment is repeated at each communion service when the priest quotes Jesus, saying “Take, eat, for this is my body, which is given for you; do this in remembrance of me,” and “Drink ye all of this; for this is my blood of the New Testament, which is shed for you, and for many, for the remission of sins; Do this, as oft as ye shall drink it, in remembrance of me.” This “communion” with the Lord and therefore with all of the body (people) of Christ is at the core of our faith. In the 1st century, as known, the Church of Rome, like all other Christian Churches, celebrated the Holy Eucharist by obeying Christ's direction and doing as He had done the night before he died, commonly called the Last Supper. 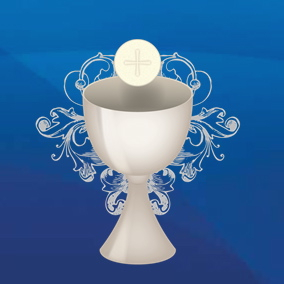 There were the bread andwine brought up at the Offertory and consecrated by the words of Institution and by an invocation of the Holy Spirit; the bread was broken and Communion was given to the faithful. Undoubtedly, too, before this part of the service lessons were read from the Bible, as explicitly stated by Saint Justin Martyr, litanies and prayers were said. It is also known that this Mass was said in Greek. Koine Greek was the common tongue of Christians, at any rate outside Palestine, and it was spoken by them in Rome as well as everywhere else, at the time when it was understood and used throughout the empire, since the conquests of Alexander the Great, later incorporated into the Roman Empire. This is shown by the facts that the inscriptions in the catacombs are in Greek, and that Christian writers at Rome use that language. Of the liturgical formulas of this first period little is known. The First Epistle of St. Clement contains a prayer that is generally considered liturgical, though it contains no reference to the Eucharist, also the statement that "the Lord commanded offerings and holy offices to be made carefully, not rashly nor without order, but at fixed times and hours". It says further: "The high-priest has his duties, a special place is appointed to the priests, and the Levites have their ministry" . From this it is evident that at Rome the liturgy was celebrated according to fixed rules and definite order. St. Justin Martyr (died c. 167) spent part of his life at Rome and died there. It is possible that his First Apology was written in that city, and that the liturgy he describes in it (lxv-lxvi) was that which he frequented at Rome. From this we learn that the Christians first prayed for themselves and for all manner of persons. Then follows the kiss of peace, and "he who presides over the brethren" is given bread and a cup of wine and water, having received which he gives thanks to God, celebrates the Eucharist, and all the people answer "Amen." The deacons then give out Holy Communion (loc. cit.). Here is found the outline of the liturgy: the Preface (giving thanks), to which may be added from I Clem. 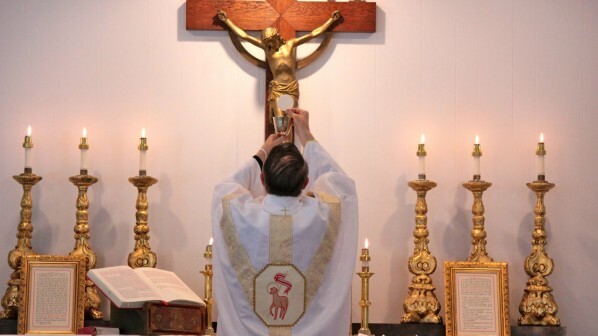 The Sanctus, a celebration of the Eucharist, not described, but which contains the words of Institution (c. lxvi, "by His prayer"), and which corresponds to the recent Canon, and the final Amen that still keeps its place at the end of the Eucharistic prayer. Perhaps a likeness may be seen between the Roman use and those of the Eastern Churches in the fact that when St. Polycarp came to Rome in 155, Pope Anicetus allowed him to celebrate, just like one of his own bishops. The canons of Hippolytus of Rome (in the beginning of the 3rd century, if they are genuine; allude to a Eucharistic celebration that follows the order of St. Justin, and they add the universal introduction to the Preface, "Sursum corda", etc.